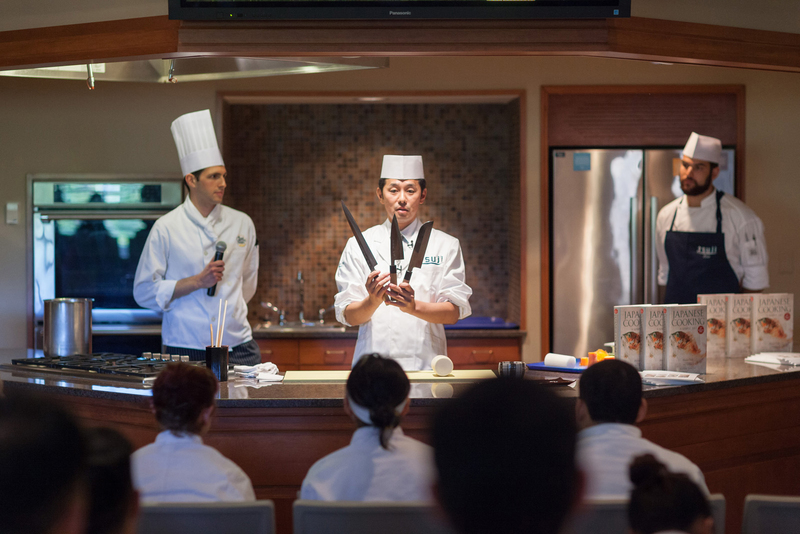 Hyde Park, NY – An innovative immersion into the cuisines and culture of Japan joins the course listings for the fall semester at The Culinary Institute of America. Advanced Cooking: Japanese Cuisine is a multi-faceted discovery of Japanese flavors, techniques, and food culture. 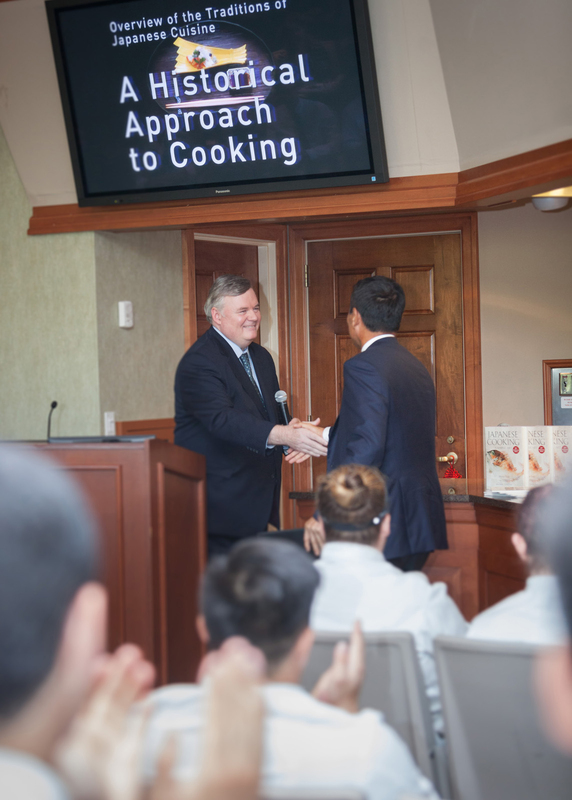 The class, offered to juniors and seniors pursuing a CIA bachelor’s degree, will be jointly taught by CIA Chef Martin Matysik (who lived and worked in Japan) and Chef Hiroki Murashima of the world-renowned Tsuji Culinary Institute in Osaka. Chef Murashima will serve as the CIA’s inaugural Suntory Visiting Professor of Japanese Studies, a new position created with the support of Suntory Group, one of the world’s leading consumer product companies. The Advanced Cooking: Japanese Cuisine curriculum covers Japanese history and culture, along with the ingredients, flavors, textures, and techniques of authentic Japanese cooking. It delves into dashi stocks, rice and noodles, sushi, tempura, and the principles of umami, as well as kaiseki cuisine and the cultural aspects of the Japanese dining table. The class meets once a week throughout the semester, beginning on September 13. Students will also participate in a field trip to experience leading Japanese restaurants and retail operations in New York City. The 18-student class filled up the first day it was offered to CIA students. The course and the launch of a broader CIA Japanese studies initiative are underwritten by a multi-year grant from Suntory. As the initiative expands, the curricula will include a greater depth of instruction in Japanese agriculture and the production of traditional foods and beverages, as well as ways to adapt Japanese flavors and products into innovative American menus. Opportunities for international travel/study experiences in Japan as part of the CIA’s bachelor’s degree programs are also under development. Suntory Group is among the world’s leading consumer products companies, with $20 billion in annual sales. We offer a uniquely diverse portfolio of beverage products enjoyed by millions around the world: from award-winning Japanese whiskies Yamazaki and Hibiki, The Premium Malt’s beer, and iconic American spirits Jim Beam and Maker’s Mark to non-alcoholic favorites Orangina, Lucozade, and Ribena. Suntory also produces wellness products and operates a flower business. Founded as a family-owned business in 1899 in Osaka, Japan, Suntory Group has grown into a multi-national corporation, with operations throughout the Americas, Europe, Asia, and Oceania. We are driven by Yatte Minahare–the spirit of bold ambition–and our 42,000 employees worldwide draw upon our unique blend of Japanese artisanship and global tastes to explore new product categories and markets. Learn more about Suntory Group, its brands, and its commitment to social responsibility at www.suntory.com, on facebook.com/SuntoryGlobal, or @SuntoryGlobal on Twitter.